A kayaker can easily rescue a fellow-kayaker who takes an accidental swim, or a swimmer in trouble at the beach. Sea kayakers often encounter a windsurfer who is in trouble because of rough water and an offshore wind. It's quite easy to rescue them and their rig. See Towing Other Small Boats. A solo sea kayaker who fails to roll may be able to self-rescue. It is fun and satisfying to practice all forms of deep-water techniques in a swimming pool and then on a calm sea in summer. Practice until you can get the casualty out of the water in twenty seconds and complete a rescue in less than two minutes. You need this practice because in a real situation the rescue is likely to be complicated by other factors, in particular by windy conditions. Other members of the group may be scared or in trouble. A casualty in cool water may be disoriented and panicking as a result of cold shock, and may soon lose much of the use of his hands due to cold. Equipment may be lost and you may be drifting into danger. Anybody who wants to join a group for advanced trips needs to be willing and able to practice rolling at sea, and to join in rescue practice at sea. If they are reluctant because they are in the habit of wearing inadequate clothing, they may have to reconsider what they wear. See Kayak Clothing. You seldom need any special equipment to carry out a deep-water rescue, but it can be helpful to carry a portable pump and a rescue stirrup and it's not the best time to have a 28 pound racing kayak and 24 ounce racing paddles. 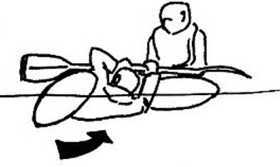 If a kayaker is upside down in his kayak, a swimmer can roll him back upright again. This is usually easy if the kayaker sits in the right posture. After capsizing, the casualty uses his knees to brace himself so that he does not fall out of the kayak, leans forward until his forehead is almost touching the front deck, bangs three times on the bottom of his kayak and waves his straight arms backwards and forwards in the air as a signal. The rescuer swims up to the kayak, reaches over it with one hand and takes a firm grip of the casualty's arm which is furthest away from him. The rescuer then uses his other hand to lift his upper body above the kayak, and falls backwards. His weight pulls the casualty's arm along firmly but GENTLY. The kayak rolls up and the casualty can breathe again. 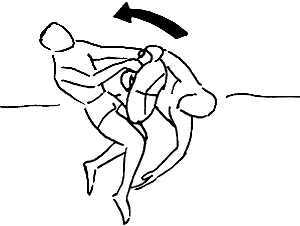 The swimmer must not pull roughly at the casualty's arm because it may give him a dislocated shoulder. Thank you to Alan Byde for kindly providing this illustration from his classic book Living Canoeing (A&C Black, 1969). This rescue may not work if the casualty weighs three times as much as the swimmer. Sea kayakers occasionally encounter a swimmer who is having trouble getting back to shore. Some kayaks are specifically designed for rescuing swimmers, but any sea kayak makes quite a good rescue tool if you have only one swimmer to deal with. If there are two swimmers, either rescue them one at a time or stay where you are and let them hold onto your kayak until help arrives. If the casualty seems calm, go straight towards him so that he can grab the end of your kayak. He can support himself and you can talk to him, but he will not easily be able to capsize you. If the casualty seems to be panicking, consider waiting for another kayaker to raft up with you before approaching the casualty. If there is another kayaker present, ask him to raft up with you. The casualty can climb onto the raft while you discuss what to do. 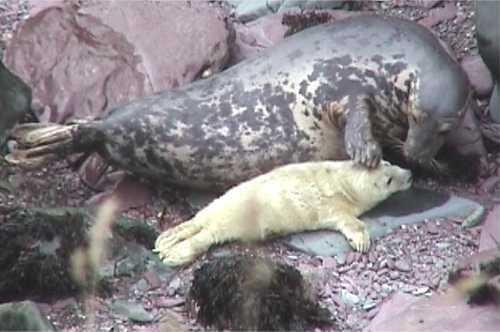 You can also use a raft as a platform for resuscitating an unconscious casualty. If you are alone with an unconscious casualty, it is possible to get out of your kayak and carry out expired air resuscitation (EAR) in the water but that is beyond the scope of this website. As for transporting a casualty, if you are only a short distance from the beach you could go straight there while he hangs underneath your bow. This is easy in the sense that you are not going to capsize, but pushing the casualty through the water is very hard work and very, very slow. If you have good support strokes and a reliable roll, there is an alternative which is faster, although still hard work. 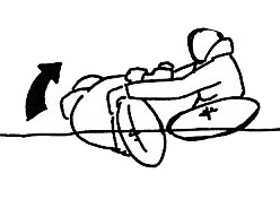 Invite the casualty to climb onto the rear deck of your kayak while you use your paddle to keep upright. See Sculling Brace. The casualty's head should be alongside your hip and his feet towards the rear of the kayak. The casualty's weight will press down the back of your kayak down and lift the front, making your kayak unstable and causing it to weathercock downwind. Unless the casualty's head is as far forward as possible, you will find it hard to balance. Whatever method you use to transport a swimmer, you can never go very fast. If you have to make progress against a current which is flowing the wrong way, you need some subtlety. See Going Against The Current. The most likely place for you to be rescuing a swimmer is at a beach, and at a surf beach the most likely place is in a rip current where water brought in by the waves is flowing back out to sea like a river. Usually you can recognize a rip from afar because the surf does not break there. Trying to go directly against the current while carrying a casualty would be like trying to run up a "down" escalator. Take him straight to the edge of the rip, where there is less current. If you have to bring a swimmer into a beach through big surf, don't come in with the swimmer on the landward end of your kayak. His or her weight will drag down the leading end of your kayak and probably make you loop end-over-end, which won't please either of you! You may be able to avoid the big breaking waves. See Getting Back To The Beach. If not, ask the casualty to go to the seaward end of your kayak and hold onto your deck rigging. In most kayaks it is best for the casualty to hold the front end of the kayak while you go towards the beach backwards. Then you can talk reassuringly to the casualty, see big waves coming, and paddle powerfully seawards to avoid being surfed towards the beach minus the casualty. The first three work on a kayaker who has capsized, is still in his / her kayak but can't roll up. They are nearly always pre-arranged between friends when one of them wants to practice support strokes and rolling at sea. After capsizing the casualty leans forward, bangs three times on the bottom of the kayak and waves his /her straight arms backwards and forwards in the air. (S)he may be able to swim up for a breath of air while waiting. A rescuer can paddle straight up to a capsized kayaker and put the front of his kayak where the casualty can reach it and simply pull himself up. The rescuer should not come in at high speed, in case the casualty chooses that moment to come up for a breath of air. A rescuer can paddle up until his kayak is parallel to the casualty's kayak but two feet away. He places his paddle so that one end is resting on each boat and the casualty can find it with his hands. The casualty grabs the paddle shaft and uses it to roll upright in the gap between the kayaks. This is just like the swimmer-to-kayaker rescue except that the rescuer is also in a kayak. The casualty may be pulled out of his kayak unless he braces hard with his knees, but even so it is an improvement on being upside down. With practice and long arms it could be carried out on an unconscious casualty. Some call this the Hand Of God rescue.